Recently the Pakistan Telecommunication authorities disabled Facebook in Pakistan but now Youtube is also banned in the country. As Facebook was banned due to specific event of drawing the cartoon of Muhammad (peace be upon him), there is no specific event which triggered the blockage of the video sharing website, Youtube in Pakistan. Pakistani authorities invited the blocked website administrators to discuss over the issues and come to a solution acceptable to both the parties. They asked youtube to remove some videos in order to be restored in Pakistan. Facebook and youtube are not the only websites being banned in Pakistan, there is a list of websites which is not yet clearly listed though. Youtube was also banned in Pakistan in past for 2 days. Banning facebook might be useful, but youtube is a informative and useful website for most in Pakistan. 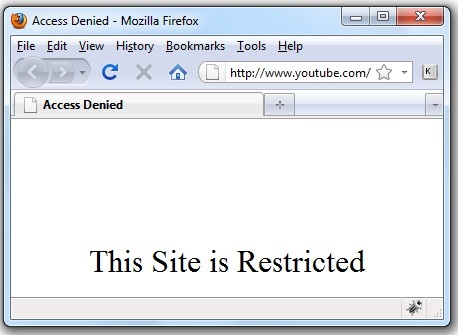 However as China has banned youtube and facebook, both in their country, but their progress hasn’t been hindered by this act, and many big powers of the world fear them to be on the rise, which clearly shows that youtube and facebook (and many other websites) are not the necessity, but just an assistance (or maybe an evil in some cases). i wish that we come up with our own alternate to these websites! I think that this temporary blockage is admirable as Pakistani authorities are in contact with administration of those sites and this ban should be kept until all those pages may be removed by those sites which are sacrilegious to Islam or any other religion. Indians should ban Pakistani websites too until they remove content against them? America should ban anti America sites too? Christians should bad anti christian sites too? jews should ban anti jew sites too? and so on? Nice idea! i hope it gets implemented soon.